A lot of creative and original comedy is based on surrealism and absurdity. Early pioneers in these comedic forms include Spike Milligan and Monty Python. Current examples include Vic and Bob, Noel Fielding and Sam Simmons. Elements of surreal and absurd comedy include the non-sequitur (where language or events do not follow a logical process/sequence), irony (where a message is conveyed in a way contrary to its content) and deadpan performance (in the face of surreal and absurd situations, furthering the absurdity). Since the 1980s, a new wave of comedy, called alternative comedy, has grown in popularity with more offbeat and experimental style. Alternative comedy was initially inspired by punk culture and rejected old comedy forms, the establishment and bigoted humour. Ben Elton, Rik Mayall, Malcolm Hardee and Alexi Sayle were among the most well-known 1980's alternative comedians. Alternative comedy experienced a revival around 2010, with Stewart Lee promoting the liberal, progressive values of the movement and many younger comedians in the UK banding together in groups dedicated to alternative comedy including The Alternative Comedy Memorial Society and the Weirdos Collective. Many comics achieve a cult following while touring famous comedy hubs such as the Just for Laughs festival in Montreal, the Edinburgh Fringe, and Melbourne Comedy Festival in Australia. Often a comic's career advances significantly when they win a notable comedy award, such as the Edinburgh Comedy Award (formerly the Perrier comedy award). Comics sometimes foray into other areas of entertainment, such as film and television, where they become more widely known; e.g., Eddie Izzard or Russell Brand. However, a comic's stand-up success does not guarantee a film's critical or box office success. 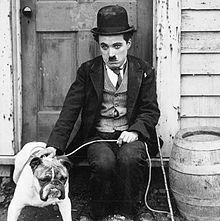 Charlie Chaplin was the most popular screen comedian of the first half of the 20th century. 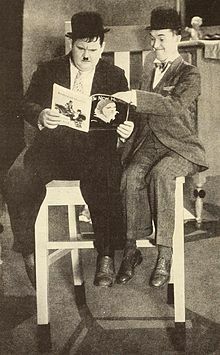 Chaplin and Stan Laurel were protégés of Fred Karno, the English theatre impresario of British music hall, and in his biography Laurel stated, "Fred Karno didn't teach Charlie [Chaplin] and me all we know about comedy. He just taught us most of it". Chaplin wrote comedic silent films such as Modern Times and The Kid. His films still have a major impact on comedy in films today. One of the most popular forms of modern-day comedy is stand-up comedy. Stand-up comedy is a comic monologue performed by one or more people standing on a stage. Bob Hope was the most popular stand-up comedian of the 20th century, and also starred in numerous comedy films over a five-decade span. Other noted stand-up comedians include Billy Connolly, George Carlin, Richard Pryor, Jerry Seinfeld, Dylan Moran, Lee Evans, Patton Oswalt and Jo Brand. Radio has been a proving-ground for many comedians. Ricky Gervais began his career at a London radio station called XFM and Chris Morris began his career at Radio Cambridgeshire. The League of Gentlemen, Mitchell and Webb and The Mighty Boosh all transferred to television after broadcasting on BBC Radio 4. Between 2002 and 2011 BBC Radio 6 Music used to feature regular shows presented by comedians including Phil Jupitus, Stephen Merchant and Adam & Joe. Now BBC radio comedy is mainly available on BBC Radio 4 and BBC Radio 4 Extra. Before television, radio was one of the main ways to enjoy comedy, The Goon Show and Hancock's Half Hour being among the most popular early shows. On television there are comedy talk shows where comedians make fun of current news or popular topics. Such comedians include Jay Leno, Conan O'Brien, Graham Norton, Jim Jefferies, James Corden, Jonathan Ross, David Letterman, and Chelsea Handler. There are sketch comedies, such as Mr. Show with Bob and David and Monty Python who created their sketch comedy show Monty Python's Flying Circus (a BBC show that influenced Saturday Night Live), then there are sitcoms, for example Roseanne, Only Fools and Horses and Not Going Out, as well as popular panel shows like The Big Fat Quiz of the Year, Have I Got News for You and Celebrity Juice. Comedy is increasingly enjoyed online. Comedians with popular long-running podcasts series include Kevin Smith, Richard Herring and PewDiePie. Comedians streaming videos of their stand-up include Bridget Christie, Louis C.K. and Daniel Kitson. Many comedians publicise their work and build an audience through social media, especially Twitter. There are many established formats for jokes. One example is the pun or double-entendre, where similar words are interchanged. The Two Ronnies often used puns and double-entendre. Stewart Francis and Tim Vine are examples of current comedians who deploy numerous puns. Jokes based on puns tend to be very quick and easy to digest, which sometimes leads to other joke forms being overlooked, for example in the Funniest Joke of the Fringe awards. Other jokes may rely on confounding an audience's expectations through a misleading setup (known as a 'pull back and reveal' in the UK and a 'leadaway' in the US). Ed Byrne is an example of a comedian who has used this technique. Some jokes are based on ad absurdum extrapolations, for example much of Richard Herring and Ross Noble's standup.. In ironic humour there is an intentional mismatch between a message and the form in which it is conveyed (for example the work of Danielle Ward). Other joke forms include observation (Michael McIntyre), whimsy (David O'Doherty), self-deprecation (Robin Williams) and parody (Diane Morgan). In a January 2014 study, conducted in the British Journal of Psychiatry, scientists found that comedians tend to have high levels of psychotic personality traits. In the study, researchers analyzed 404 male and 119 female comedians from Australia, Britain, and the United States. The participants were asked to complete an online questionnaire designed to measure psychotic traits in healthy people. They found that comedians scored "significantly higher on four types of psychotic characteristics compared to a control group of people who had non-creative jobs." Gordon Claridge, a professor of experimental psychology at the University of Oxford and leader of the study claimed, "the creative elements needed to produce humor are strikingly similar to those characterizing the cognitive style of people with psychosis—both schizophrenia and bipolar disorder." However, labeling comedians' personality traits as "psychotic" does not mean that individual is a psychopath, since psychopathy is distinct from psychosis, and neither does it mean their behavior is necessarily pathological. United Kingdom 51 John Bishop's Britain, The John Bishop Show, Panto! ^ The Forbes 2016 list appears to exclude people often regarded as comedians who are better known for other professions, despite having earned more than some in the list's top ten, including actors Adam Sandler and Melissa McCarthy, and late-night talk show hosts Stephen Colbert and Jimmy Fallon. ^ "Simpson's Contemporary Quotations, 1988". Archived from the original on 2008-03-16. Retrieved 2008-04-01. ^ Sigler, Michael S (1 May 2001). "Charlie Chaplin Biography". Retrieved 2 December 2013. ^ "'stand-up comedy' definition". Retrieved 2 December 2013. ^ Forbes (27 September 2016). "The World's Highest-Paid Comedians 2016". Retrieved 18 January 2017. ^ Berg, Madeline (27 September 2016). "The Highest-Paid Comedians 2016: Kevin Hart Dethrones Jerry Seinfeld As Cash King Of Comedy With $87.5 Million Payday". Retrieved 18 January 2017. ^ Desta, Yohana (27 September 2016). "Amy Schumer Is the First Woman to Land on Forbes' Highest-Paid Comedians List". Retrieved 18 January 2017.